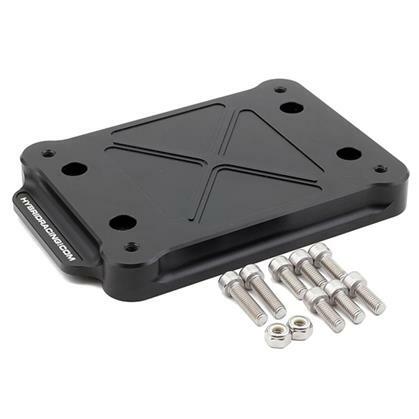 HYB-SMP-01-05 - Hybrid Racing Shifter Mounting Plate - Pann Auto Performance - San Diego largest aftermarket automotive performance parts - What do you drive? The Hybrid Racing solid shifter base allows users to mount a DC5 shifter directly onto the top of the exhaust tunnel in any EF, EG, EK, DA or DC2 chassis. This high-quality shifter base is not only CNC machined out of a solid piece of billet aluminum but it is finished in a beautiful Dust Black finish. This base also includes a rubber lower seal which prevents dust, dirt, debris, and fumes from entering through the open chassis hole. Mount the Hybrid Racing RSX shifter or the factory unit with the included hardware. Requires two small M8 holes to be drilled similar to our K-swap bolt-in shifters.